If you’ve come here, you’re probably wondering how drones work. Let’s begin with some background and explore what drones really are and how they’re used first. If you’ve come here, you’re probably wondering how drones work. Let’s begin with some background and explore what drones really are and how they’re used first. Drones, which are also known as quadcopters, multirotors, or Unmanned Aerial Vehicles (UAVs), are powerful machines that basically function as flying robots. Most times there is a source of power (usually a battery pack) that’s used to drive horizontal propellers that give lift to the vehicle. Available in multiple shapes and sizes, they were initially developed by military and government agencies for surveillance and reconnaissance purposes. After aerial technology progressed far enough, military drones were then armed with bombs and missiles for wartime use. 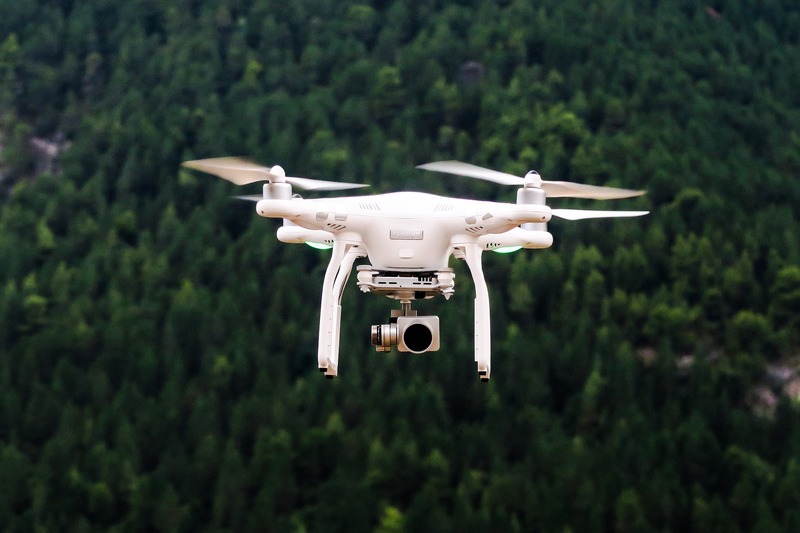 Today, drones are also being used for more humanitarian and commercial purposes, as videographers, photographers, police departments, farmers, search and rescue teams, real estate agents, and curious people all over the world discover how to take to the skies. While the military departments of each and every country may have specialized super-drones, the size and shape that might be used by the average person will vary. We can see how drones work differently by broadly categorizing them in accordance with their size i.e. very small drones, mini drones, medium drones and large drones. Very small drones are usually thought of as toys, and may not have any camera or have limited range capabilities. Mini drones usually include first person view (FPV) racing drones and can include many of the DIY, build-it-yourself versions that can travel quickly and at a small range from the pilot. Medium sized drones are usually thought of as drones with increased range and camera capabilities that can be used by hobbyists or professionals. You can consider DJI, Yuneec, GoPro, Autel, and 3DR in the “medium drone” category. Large drones usually require a high level of skill to operate and can carry very, very expensive camera equipment or even transport lifesaving cargo! Drones can also be classified by their type of flight method and hardware. Some of the most common types of flight methods include fixed wing, multirotor, and quadcopter. The flight method is one of the most important characteristics in determining how drones work. Fixed wing drones have exactly that, wings that are fixed on the side like an airplane like the GoolRC. They typically need a runway or catapult for hassle-free launching whereas other fixed wing drones can be launched via the operator’s hands. This type of drone can fly at high speeds and usually will stay airborne longer as compared to multirotor drones. For instance, the eBee senseFly fixed wing drone, which is generally used for the purpose of agricultural mapping and crop health analysis, travels along a pre-programmed route and conveniently captures high-quality images that are later integrated in 3-D models as well as maps. This type of drone is widely used by farmers for improving their agricultural processes, crop yield, and enhancing their production due to the large areas of land that they need to cover. On the other hand, multirotor drones are more popular for most pilots and (as the name implies) have multiple motors on arms that drive propellers which generate lift. Multirotors and quadcopters are extensively used by photographers and videographers as the nicer models can be easily maneuvered in the air and are very stable. The difference between multirotors and quadcopters is that multirotors can have as many arms as are necessary (many of the most expensive and impressive drones are multirotors) while a quadcopter is limited to 4 arms and 4 separate propellers. Multiple arms and propellers differentiate quadcopters from RC drones (with 1 propeller) because they enable extra speed, height, stability, weight capacity, and mobility. The DJI Phantom series is the most well-known in this category. These latest, many-armed drones are capable of some incredible tasks, whether it’s lighting up a forest at night like it’s full noon, or carrying people to far away destinations. Understanding how drones are constructed is an important piece to understanding how drones work. These machines are typically created from materials that are lightweight like plastic or composite material. Lightweight construction reduces the the weight of the machine, improves maneuverability, improves available flight altitude, and increases flight time. Each drone type has trade offs, however. For example, fixed wing drones tend to have a longer flight time, but are more difficult to maneuver, while multirotors can spin on a dime but have a more limited long distance flight range. Many aerial drones in the consumer market have multiple rotors since they require extra stability for lifting the battery, camera, and body of the UAV. Multiple motors provide additional lifting capabilities and enable the drone to fly faster and higher and carry extra weight. Operators should use caution when carrying cargo with drones, as the additional load can cause an unwanted crash if not planned for properly! When people see amazing aerial photography, it usually prompts them to want to understand how drones work. After all, UAVs are incredible platforms for taking great pictures from a unique and higher perspective and they’re a fast-changing technology that can captivate the imagination. To capture new angles, drones can feature highly advanced cameras with multi-axis gimbal systems for increased stability. Many of the latest drones are equipped with 1080p, 4K output, or even 2x optical zoom! The cameras are controlled remotely via a smartphone or display screen by either the pilot or a second operator whose sole job is to control the movement and focus of the camera. Many experienced photographers use knowledge of how drones work in conjunction with camera technology to compose excellent pictures and run aerial photography, videography, and mapping businesses of their own. Make sure to read our post on finding drone video services before you hire someone to do aerial photography work! In order to input their commands and fly their drones efficiently, drone flyers need effective controllers. Many quadcopter, multirotor, and UAV systems can be easily controlled by intermediate to beginner users via the latest handheld pilot remote controls. These controllers are used for launching, landing, taking pictures & video, and navigating airspace and come in varied forms that include tablets, smartphones and gamepad based controllers. In order to understand how drones work, it’s important to know that controllers must communicate with the drones with the help of radio waves. Typically, drones are operated using 2.4 or 5.8 gigahertz of radio frequency. In many cases, the UAV also transmits live video back to the pilot to enable feedback in real time. In fact, this is the same frequency that your wifi router probably uses! The latest higher-end aerial control systems have advanced features like GPS tracking to position and stabilize in the air, return-to-home in case of a lost signal connection, and collision avoidance that makes sure near-misses don’t become last flights. GPS has been a major advancement in the aerial world because it allows operators to direct the movement and direction of the drone instantaneously and exactly. Some of the latest drones on the market like the portable and compact Mavic Pro sport software like tap to fly, “follow me” mode, and active target tracking are some of the more advanced features that are quickly becoming more and more accessible with each new release. Upon startup, the batteries engage power to the rotors, the drone propellers start spinning, and the pilot is able to change the direction and altitude of the drone. By increasing the speed of the rotors, drone pilots can lift the machine higher, enabling it to fly at higher altitudes. They can also tilt the UAV on either side and provide it with additional lift and move it backwards or forwards with simple game pad style controls. The latest consumer mid sized drones come with gyroscopes and accelerometers that enable them to maintain their direction while in flight. Such instruments are capable of detecting linear speed, tilt, and other cues that further restrict the drone from falling out of the sky or off of the planned flight route. Manufacturers are starting to include these features which have a large influence on how these drones work and how pilots will need to master these skills. In a nutshell, drones play a major role in our lives today. Understanding the basics of how drones work will prepare you to make informed decisions on a drone for your specific application. It must be noted that the technology used for flying and operating drones is evolving with every passing day. In fact, when combined with advanced features and artificial intelligence, quadcopters and multirotors may be able to exceed a our expectations as a society about what’s even possible. The consumer drones that are readily available in the market today are increasingly getting affordable and are already leaps and bounds more capable of performing advanced tasks in comparison to what they were originally capable of. There’s never been a better time to jump in, learn how drones work, and join the fun! Oliver is the creator of MyDearDrone.com, a free community to learn everything from news, reviews, guides and much more about drones and technology.